This interview is part of The ‘A’ Word series, produced in partnership with the Bush Institute to examine how “accountability” became a “dirty word,” and what can and should be done going forward to ensure accountability withstands the test of a bad reputation. The interviews were conducted over the telephone, transcribed, and edited for clarity and length. The same questions, or types of questions, were put to each participant to see what they thought independently and collectively about accountability. Their answers will take the reader into the inner workings of schools, the intricacies of the politics of education, and the ways in which campuses can better serve students. Click through the grid below to read other ‘A’ Word conversations. Felicia Cumings Smith is the assistant superintendent of academic services at Jefferson County Public Schools in Kentucky. Previously, she was a senior program officer of K-12 education at the Bill & Melinda Gates Foundation and served as Kentucky’s chief academic officer and associate commissioner of education. She has deep experience as a teacher, teacher-leader, and administrator. Smith started her career as an elementary and reading resource teacher in Jefferson County Public Schools, where she helped design and lead curriculum work in literacy and formative assessment benchmarks. In this ‘A’ Word interview, she draws upon her experiences to discuss how school accountability has been applied in a largely rural state. As she explains, being transparent about goals and communicating well about those goals is essential, especially when difficult conversations are required. She also contends that the new Every Student Succeeds Act gives states the opportunity to have a different conversation about accountability. That would include using a broader range of metrics, such as how many teachers in a school are certified to teach in a subject like math. 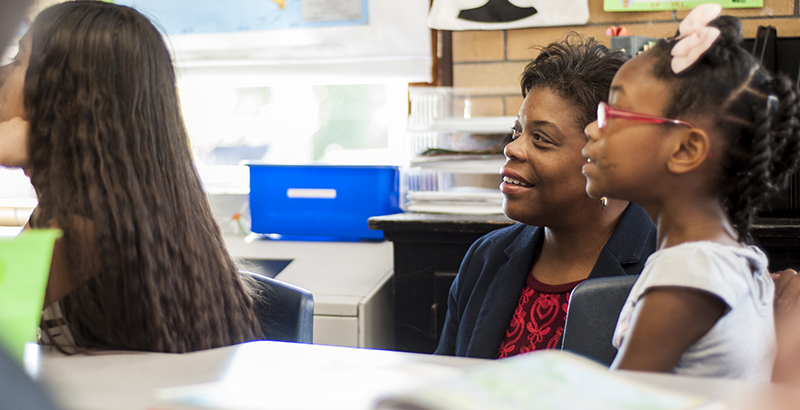 She believes that accountability systems should lead to greater support systems for school districts so that students can become readers, writers, and problem-solvers — the skills they need for a prosperous future. How do you define accountability? I define accountability as taking responsibility for whatever I am providing insight. For example, at the Kentucky Department of Education, I had accountability for all things teaching and learning. I had to ensure that students across the Commonwealth of Kentucky were achieving certain standards. And I was accountable for leaders and teachers exposing children to learning opportunities that would accelerate their achievement and performance against those standards. How would you explain the basic elements of school accountability to parents? 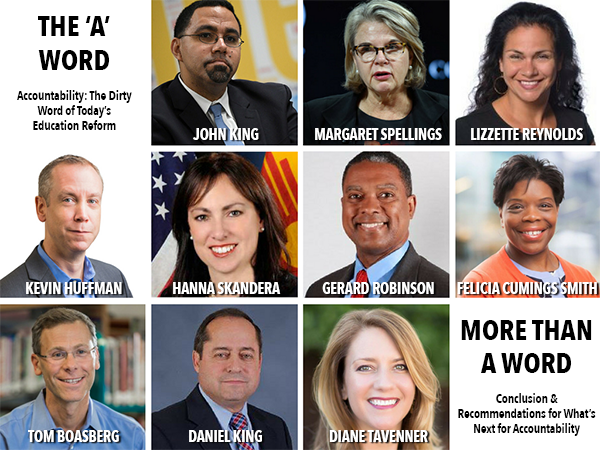 One way accountability can be defined is through a high-stakes lens, which is when the school and district are held accountable for educating children, creating equity, and ensuring that students achieve. High-stakes accountability typically relies on state-level assessment data that carries consequences for performance. Accountability also can be defined in a lower-stakes manner that is more focused on meeting goals and expectations through locally defined measures. The goals and vision of the district and school are typically responsive to the community’s needs. Has your definition changed over time? I grew up in the education system in Kentucky, where standards-based reform started in 1990 as a result of the Kentucky Education Reform Act. There was a lot of emphasis on high-stakes accountability. At the time, I was going through my teacher preparation program and beginning to make sense of what this would mean for me and what it meant for my students. As a result, I always assumed a high level of accountability for what my students learned and how that would impact my decisions as a teacher for student progress and school-wide improvement. As I have moved throughout my career, and most recently thought about accountability from a state level, I have seen accountability hit peaks and valleys. At its height, the state has communicated expectations in a transparent way. It also has coupled that with a system of support for districts and schools. I have also seen accountability incent some pretty perverse behaviors. Typically, this occurs when a high-stakes system leads with a punitive approach. Systems like that don’t create environments where districts and schools work together to reach goals for improved student learning outcomes. Today, I’m more convinced that there should be a balance of local and state-level accountability. An accountability system needs to be able to communicate how well a school, district, or state is meeting desired outcomes for student learning. And, it should do so in a very transparent way, using multiple data that make sense to educators, parents, and the community. How did you use the concepts of accountability as a teacher and as a state leader? What did they help you accomplish? As a teacher and a district leader, accountability allowed me to look at the state-level assessment in a way that helped bring improvement. We didn’t use the phrase “continuous improvement” at the time, but that is how I viewed accountability as a teacher. I looked at state-level assessment data and data from my classroom with my colleagues in the building, and then made decisions about curriculum and school-wide improvement. The same occurred at the district level. Understanding what state-level data could and could not tell me was very important as I made decisions about steps to improve student outcomes. I worked for a superintendent who believed in the use of data to drive improvement. We were asked to look at statewide assessment data primarily in comparison to other districts. That was difficult to do since we were the largest district in Kentucky and other districts didn’t have the same demographics as Jefferson County. Still, we all knew that we were working towards the same standard. The focus was on ensuring that the district was performing at a high level. Districts that were typically underperforming needed more high-touch support. We were able to pinpoint how to provide intensive support to districts in a systematic way through networks. We looked at data to verify with educators what was occurring or not occurring, to determine a plan of action for assistance. My team was also responsible for implementing a new educator evaluation system in 2011–2012 which aimed to evaluate and improve teaching and learning for teachers across the state. Before 2011, Kentucky had 173 different evaluation systems that were holding teachers accountable against very different standards and with very different protocols. Our team’s orientation was to bring about greater equity and fairness in the system with a more meaningful approach to providing support to improve teaching. Equity and accountability go hand-in-hand. What did you encounter when you were trying to get buy-in from educators? Because I took a nontraditional path to leadership, I had to earn the trust of my colleagues statewide. I had the trust of teachers, and I knew I needed to gain buy-in from superintendents and principals across the state. Because I had worked as a teacher and teacher-leader, at the district level in curriculum, and then at the state agency, I had already established some relationships I could draw upon. I built trust with our teachers union. That trust, along with working collaboratively with many state organizations, allowed me to lead and support reform strategies alongside districts and schools. I would use data to ask, “What are the challenges we are facing together?” Data can be a powerful way of entering into conversations that help everyone gain a better understanding of a situation. When you are working collaboratively to build an accountability system, whether an evaluation system or a statewide accountability system, you have to make major investments of time with partners. You have to lean into the messiness and have honest conversations, knowing that sometimes when you go public, you might be surprised by those very people that you had much different conversations with before. You referenced private conversations that change once they become public. Could you tell us more about that? I realized quickly that when you’re embarking on change initiatives of the scope that we were trying to accomplish, that organizations, especially state-level membership organizations, have to be responsive to their members. I learned that I needed to get smart about the narrative they wanted to create for their constituents, and I learned how to find our points of agreement for the common good. As an example: I worked closely with our statewide education association and a union in Jefferson County. There were some things that we could fully support together and there were areas where we had full disagreement. In those places, we would seek additional information and try to come to a conclusion. We would always drive towards what the research said on a topic, how we could modify that for Kentucky if necessary, and what we could all live with once a decision was made. That seemed to be the most acceptable strategy for getting to a better place around key policies, specifically around our educator effectiveness system. This required me to do some homework and stay abreast of how the national affiliate approached topics of interest to our local association. In a lot of circles, accountability is still seen as “blame and shame” or a game of “gotcha.” How do you change that perception to see that it is something different? The punitive aspect is typically associated with high-stakes accountability that, in the past, often came without support for improvement. It was about compliance. I hope we are shifting as a nation. If we can work in partnership with districts and schools to build capacity where there might be deficiencies, or lack of expertise, and complement that with supports for what the districts and communities value as well as standards for excellence, you can begin to flip the conversation. I’m not naive enough to believe that everyone enters into accountability with this same orientation. We wouldn’t be in the situation that we’re in today, where we have gross numbers of students who are underserved. If a district or school has demonstrated that they are just unable to deliver on the promise of educating all children, specifically children who have been underserved for years, decisive action should be taken. That’s not any different from how we would view accountability if we were trying to lose weight or get better at a sport. We should focus on getting to a plan that can reverse negative trends and create different results. As we think about accountability, we should be thinking about having an accountability partner district or school. Could we partner up districts who are doing well with districts who are not and have the state agency provide support? Could we find ways to incent behaviors for districts and schools, within the same state, to support one another? Could we begin to think about all meaning all and desire better outcomes for all of our children? Collaboration and learning together are keys to success. What should we expect of school district leaders, school board members, state legislators, and state education leaders under the Every Student Succeeds Act when it comes to ensuring all students learn and succeed? I would expect school board members to represent their community well, come with a spirit of collaboration with the superintendents as opposed to being steeped in specific agendas. Superintendents need the buy-in of their local board members. It also is the right of school board members to question what the district is doing to bring about excellent outcomes for students. They need to do so with good intent, and they should get the information needed to help make better policies and decisions. The role of state and district leaders is to be transparent about what data tells the community, and then work in partnership with the district and communities to help traditionally underperforming students. Those leaders should work with parents to help them better understand what the system should be doing for their children. State leaders should also help districts and schools understand what it means to continually improve and hold them accountable for doing that. What would your perfect accountability system look like? I would advocate for a 60/40 match for accountability, with 60 percent of the accountability coming from state metrics and 40 percent from local metrics. For example, we should know how many national board-certified teachers are in your district. How many teachers have received advanced degrees or certifications? And what is their impact on student learning, especially of those students most in need? If you’re in a community where teachers are teaching outside of their certification area, the public should know that. That’s an important accountability metric. Metrics affiliated with social-emotional learning should be considered, too. While these metrics are not yet as sophisticated as we would like, this is a place where we can begin to innovate. What uncomfortable truth or truths in education have we as a society been unwilling to address? How we take on systemic racism in our system, specifically examining the structures, policies, and practices that prevent us from realizing an excellent education for all students, particularly black and brown students. No Child Left Behind was refreshing because it elevated some aspects of this conversation. It required states to be honest and transparent in a way they had not been before. NCLB defined some clear expectations around educating children of color that raised awareness to reporting on their performance. I’d love to see a closer examination of our practices highlighting the types of opportunities students of color receive or not. If we believe all means all then we should make sure our actions line up to our words. We also need to talk about the types of supports that are necessary for a changing student population. I am deeply concerned about accountability for transient populations, homeless children, undocumented children, and students with special needs. What’s at stake for the country and Kentucky to get these issues right? What’s at stake for us as a country is our economic growth, innovation, and security. If we don’t figure out a way to better hold systems accountable for educating all learners, we will continue to lose a population of students whom we need to add value to our collective future. Getting these issues right is ultimately an issue of keeping our country united, as well as having an educated populace. This has huge implications for our growth and prosperity as a nation. I am from a rural, poor state. With 57 percent of children across the nation living in rural contexts, we have to meet the needs of children in this context as well. For my state, accountability means ensuring children have a pathway to a future that will help them be informed, productive, and active citizens. It also means positioning them to have a livable wage where they can contribute to their community accordingly. I would hope that we could create a system that is innovative enough for children in Eastern Kentucky — as well as the rest of my state — to contribute to a national or worldwide economy without leaving the place they call home.